The University of Wolverhampton is celebrating after being announced as one of the top 100 employers for lesbian, gay, bi and trans staff. 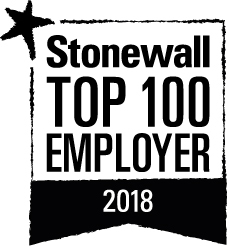 Stonewall’s Top 100 Employers is the definitive list showcasing the best employers for lesbian, gay, bi and trans staff. It was announced today that the University of Wolverhampton was ranked 62 out of 434 employers. Its previous ranking was 164th. Key projects at the University have included leading efforts to ensure Wolves Pride was bigger than ever, updating its policies to be inclusive of bisexuality and non-binary gender identities and involvement in running a range of public events. The University has also supported the formation of the Wolverhampton LGBT+ Alliance and a Higher Education LGBT Network of Networks for higher education. Dr Sarah Slater, Joint Chair of the LGBT Staff Network, said: “The news of the ranking is a sign that the University continues to become a more welcoming place for staff and students who identify as LGBTQ. It is a real pleasure to meet and teach every student who does not feel they have to hide their Gender or Sexuality, and this is only possible from the continued work of the University of Wolverhampton in Equality and Diversity and becoming an example to other organisations on inclusivity." Will Cooling, Head of Equality and Diversity, said: "As a University we have placed a great emphasis over the past year on being a visible advocate for LGBT Equality. We have organised a series of public events to highlight the unique contribution made to society by LGBT people, and explore the unique challenges they face. “We have been active outside of campus, being a founding member of the new Wolverhampton LGBT Alliance and supporting LGBT community events held in Wolverhampton, Walsall, Shropshire and Birmingham. We are delighted that this work has been recognised by Stonewall, and excited by the further work we have planned, including supporting the production of Wolverhampton's first ever LGBT History Month Brochure, and holding our first ever Trans and Non-Binary Visibility Conference on 21 March 2018." Now in its 14th year, the Stonewall Top 100 Employers list celebrates the pioneering efforts of leading organisations to create inclusive workplaces. It showcases the best performing employers on Stonewall’s Workplace Equality Index 2018, an annual audit of workplace culture for lesbian, gay, bi and trans staff. A total of 434 employers submitted entries to the 2018 Index, across the public, private and third sectors. More information about Equality and Diversity at the University of Wolverhampton.